PT610 Advanced Indicator with cables exiting from the back, fitted with AU mains plug and cable suitable for Australia, New Zealand and China. The sloping front panel and rubber feet are ideal for mounting on a desk but the PT610DM can be mounted on a wall. desk or column with optional mounting brackets. 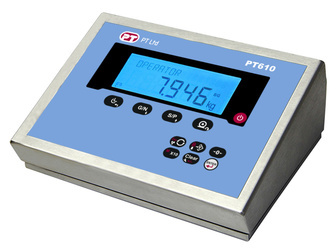 Data Sheet for PT610 Advanced Indicator. Manual for operation and set up of the PT610, PT620 and PT630 without the fieldbus information.